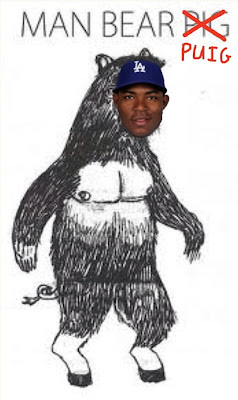 With Yasiel Puig already in the show, I guess we won't be hearing any more news about his exploits in the Dodgers' minor league farm system. On the other hand, he did play most of the last month in Chattanooga, so I guess he gets one last hurrah. Just announced today are the Dodgers Pride Award Winners for May - given to their minor league players of the month. Pitcher - RHP Blake Johnson posted a 3-2 record with a 1.96 ERA (8 ER/36.2 IP), striking out 32 batters against eight walks in six May starts. Johnson had quality starts in five out of six games in the month and is currently on a run of five straight quality starts. The 27-year-old was among the Pacific Coast League leaders in ERA (1.96, 5th) and wins (3, T-9th) in May. Johnson was selected by the Dodgers in the second round of the 2004 First-Year Player Draft. Player - IF/OF Elian Herrera posted a .363 (33-for-91) batting average, which tied for eighth-best in the Pacific Coast League during May, with 33 hits, three home runs and 10 RBI in the month. On the season, Herrera has come through consistently in big moments, batting .348 (16-for-46) with a homer and 20 RBI with runners in scoring position. 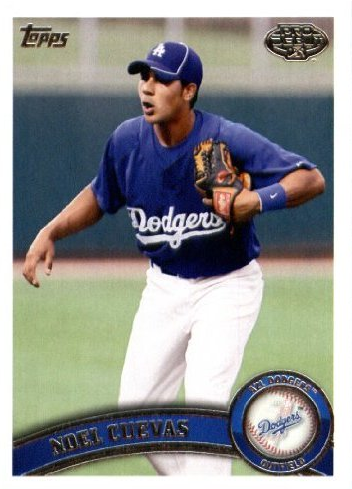 The switch-hitter was signed by the Dodgers as a non-drafted free agent on May 14, 2003. 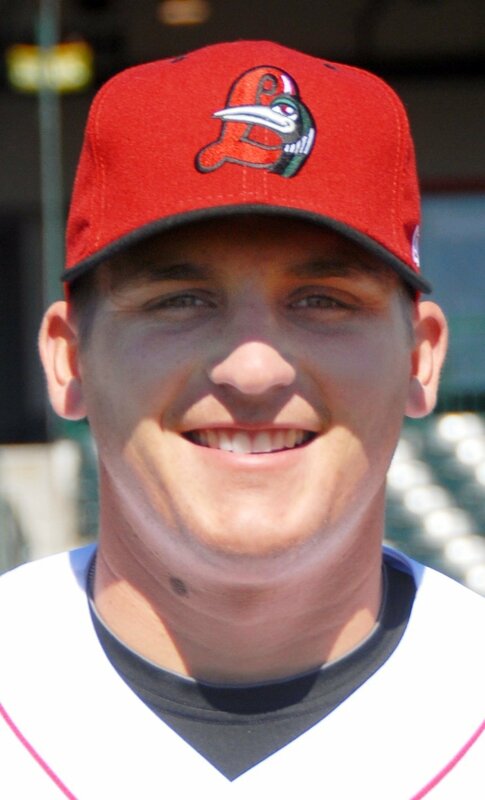 Pitcher - LHP Rob Rasmussen posted a 2-1 record with a 1.97 ERA (7 ER/32.0 IP), fanning 29 batters against seven walks in six May games (five starts). The Pasadena native recorded quality starts in four of his five starts in the month and struck out at least five batters in each start, holding the opposition to a .200 batting average. Rasmussen went 13 consecutive innings without surrendering an earned run from May 15-31 and is 3-3 with a 2.42 ERA through 12 games (11 starts) this year. 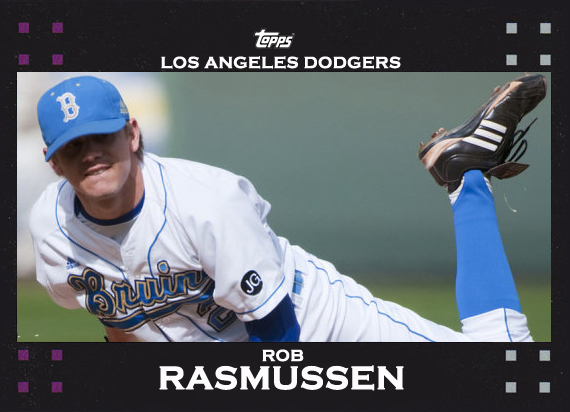 The Dodgers acquired Rasmussen in a trade with the Astros on Dec. 20, 2012 and was originally selected by Houston in the second round of the 2010 First-Year Player Draft out of UCLA. Player - OF Yasiel Puig posted a .301 batting average with 28 hits, nine doubles, four home runs, 26 RBI and 11 stolen bases in 26 May games to take home the May Dodger Pride Award for Chattanooga. The outfielder ranked among the league's best in RBI (26, T-2nd), stolen bases (11, T-3rd) and doubles (9, T-8th). 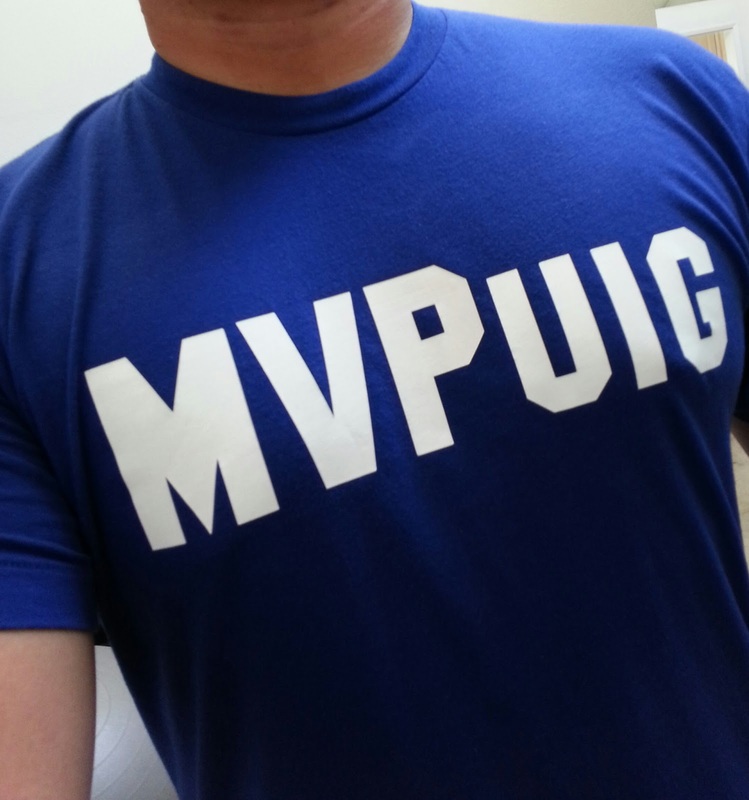 Puig recorded an RBI in five games in a row from May 25-30, totaling 12 RBI during that stretch. 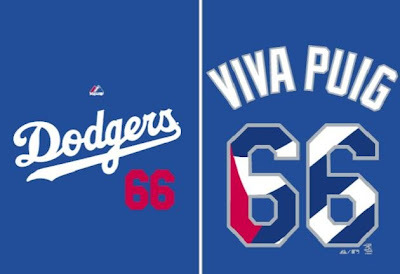 Puig, who was signed as a free agent on June 29, 2012 out of Cuba, was recalled by the Dodgers and made his Major League debut on June 3 and finished his first week in the Majors with a .464 batting average (13-for-28), four home runs and 10 RBI in seven games (including five multi-hit efforts) to earn NL Player of the Week honors. Player - LHP Jarret Martin went 3-1 in May with a 2.41 ERA (9 ER/33.2 IP) in six starts. In the month, the 24-year-old collected 37 strikeouts against 16 walks while limiting the opposition to a .236 batting average. Martin was originally selected by the Baltimore Orioles in the 18th round of the 2009 First-Year Player Draft and was acquired in a trade with the Orioles on Dec. 8, 2011. Player - OF Noel Cuevas batted .336 (34-for-93) in May, driving in 24 runs and clubbing three homers. On the year, the native of Puerto Rico has a .314 batting average, the fifth-best overall mark in the California League, including a .333 (17-for-51) batting average with runners in scoring position. The 21-year-old was selected by the Dodgers in 21st round of the 2010 First-Year Player Draft. Player - RHP Jharel Cotton posted a 3.67 ERA (14 ER/34.1 IP) in six May starts. Cotton limited opposing hitters to a .206 average with 31 strikeouts, while limiting left-handed hitters to a .160 batting average. Cotton was recently named to represent the Loons in the Midwest League All-Star team alongside teammates Carlos Frias and Tyler Ogle before being promoted to Double-A Chattanooga. 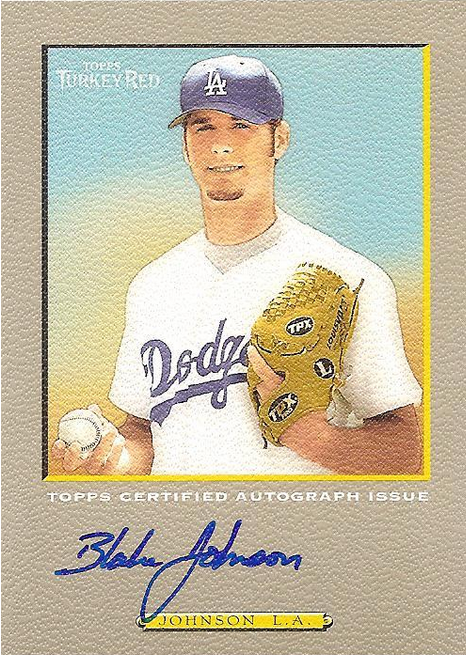 The right-hander was selected by the Dodgers in the 20th round of the 2012 First-Year Player Draft out of East Carolina University. Player - INF Kevin Taylor posted a .263 (20-for-76) batting average with a homer and seven RBI in 21 May games. On the season, the 21-year-old is batting .321 (9-for-28) with runners in scoring position and .309 (25-for-81) against right-handed pitchers. A native of Portland, Oregon, Taylor was drafted by the Dodgers in the 26th round of the 2011 First-Year Player Draft from Western Nevada Community College. This isn't a surprise, is it? 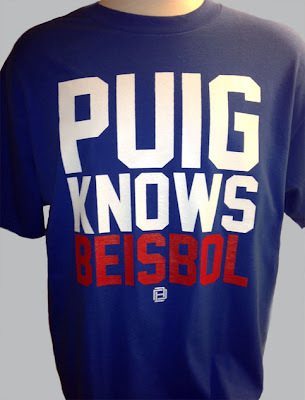 It has just been announced that Yasiel Puig won this past week in the National League. He has been named the NL Player of the Week, from June 3rd to 9th. May there be more weeks like this in the future. Puig became the first Dodger to record a multi-hit performance in his first big league game since Russell Martin went 2-for-4 in his debut on May 5, 2006. According to Elias Sports Bureau, Puig joined Dino Restelli as the only players in Major League history to have recorded a two-homer, five-RBI game within the first two games of his career. Restelli accomplished the feat on June 15, 1949 as a member of the Pittsburgh Pirates. Puig became just the second player since 1900 to hit four home runs in his first five games, joining Mike Jacobs of the 2005 New York Mets (Elias Sports Bureau). On Friday, his solo shot gave Puig 10 RBI through his first five career games, tying a Major League record (also: Washington’s Danny Espinosa in 2010 and Pittsburgh’s Jack Merson in 1951). With his first Player of the Week honor, Puig becomes the first rookie to win for his debut week since Baltimore’s Manny Machado (A.L.) (August 6-12, 2012). 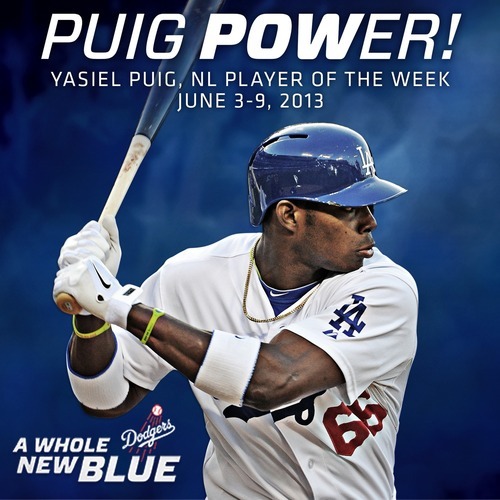 Puig is the first Dodger rookie to win the award since Andre Ethier (July 3-9, 2006). Hank Azaria was at the game yesterday and read the Dodgers lineup. 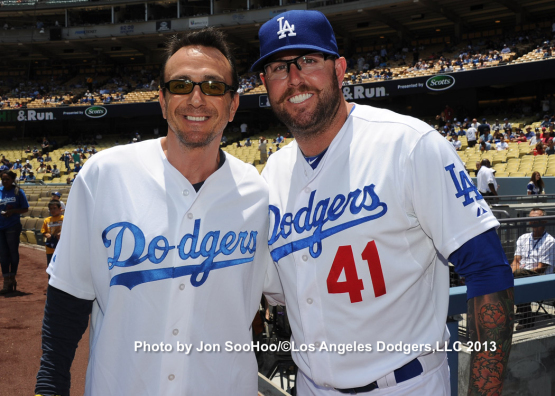 In the pic above he is posing with Peter Moylan. Photo via Jon SooHoo/LA Dodgers 2013. The news just keeps getting worse. Via Austin Laymance at MLB.com, "Hanley to have MRI on hamstring; Kemp has setback". Adam Nodiff at The Baseball Professor writes about Puig, a survey on him and his thoughts about his potential. 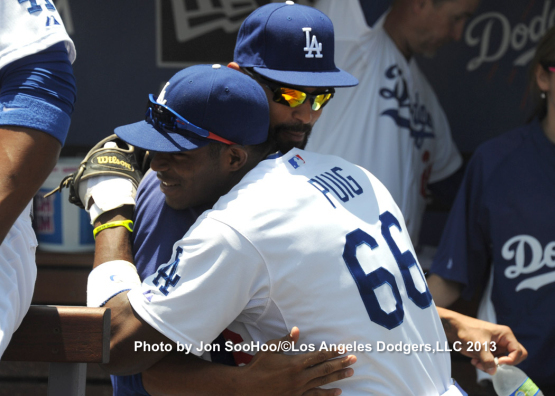 "The growing legend of Yasiel Puig," via Dave Cameron at FanGraphs. "We can't continue to play short. I played with two extras today and a backup catcher. You can't play in a National League game like that," Mattingly said after the game. "You can get away with it in the American League, but we can't continue to do this. If you can't play you've got to go on the DL." Ethier was unavailable Sunday after fouling ball off the arch of his foot on Saturday. "He tried to swing early in the day and wasn't able to do it," Mattingly said. "I don't know where we'll be tomorrow with that." Funny stuff. Via Outside the Boxscore, "Hank Azaria reads Dodgers line-up like "Apu" from The Simpsons". All Trade Bait, All the Time shares his day at Dodger Stadium yesterday and has a bunch of pics to prove it. Ron Cervenka at True Blue LA shares a bunch of pics from the Old Timers Game. 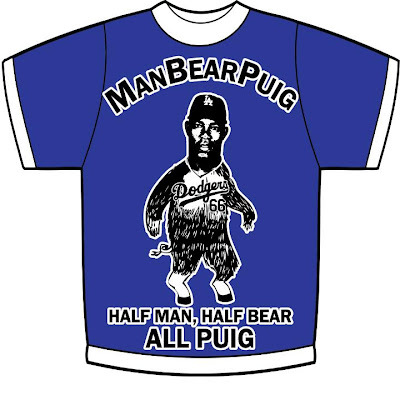 Yesterday, I made note of a post on my Blog Kiosk of a Big League Stew story focused on the fine work of an enterprising Dodger fan seeking to express his love of Puig on a T-shirt. The Big League Stew story made note of a graphic put up by Dave Pomerantz on twitter. See it below. I am unsure if this shirt actually exist, but if it does I might have to get one. For those who don't understand the reference check out this story by Dayn Perry at CBS Sports. Well, after spending some time on Reddit over the weekend I dicovered that Man Bear Puig has a little bit of a following already. It appears it was first initially proposed by a redditor named mongo1834, using the below graphic. Awesome, right? After all, Man Bear Puig is the greatest threat to Major League pitching the world has ever seen. At least, that's what I like to think. Then, I discovered that there are several other T-shirt designs worthy of a look. See what I discovered below. The above T-shirt was made by redditor PRguy1789 and can be purchased here. It's simple and clean, and I don't think you'd have to worry about the South Park boys screaming copyright in your face. The next one is just as simple. It says what we are all thinking and hoping for. Can his exploits this year translate into a MVP-type season his first year in the league? The below shirt was made by redditor lookitskelvin. This next T-shirt is a play on that old Nike/Bo Jackson marketing campaign. 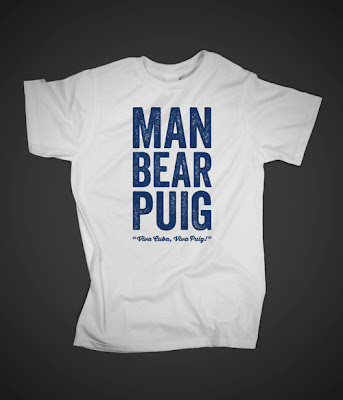 It was made by Dodgers Beat and can be purchased here. 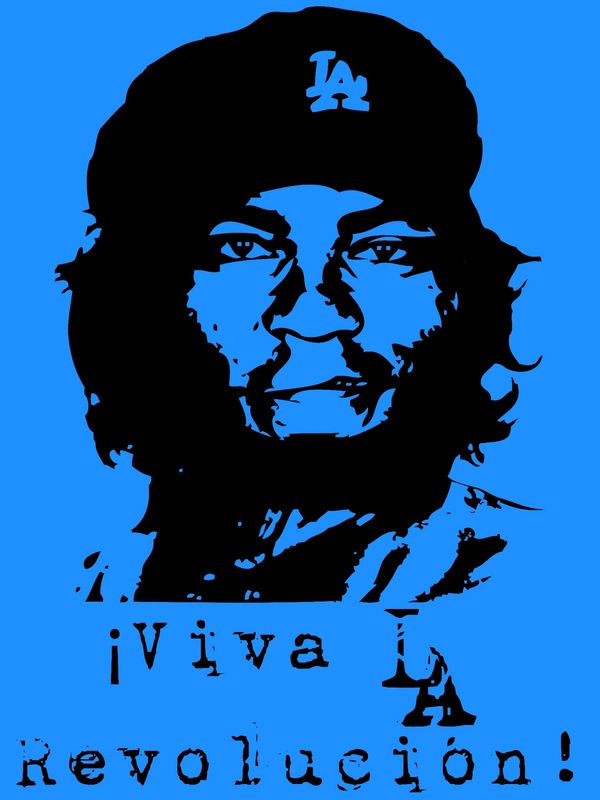 This next one might be considered a bit controversial since I'm not sure if many Cubans would appreciate the connection. Regardless, it creatively melds Baseball and a pop cultural reference. It was created by redditor ese51, and can be purchased here. BTW, the design at the very top was made by the Dodgers and those T-shirts are available for sale at Dodgers Stadium. That shirt has sold like gangbusters. UPDATE: I apologize for being wrong about this. The shirt at the very top was given away to fans during a game. The shirt mentioned in the tweet below is another design.